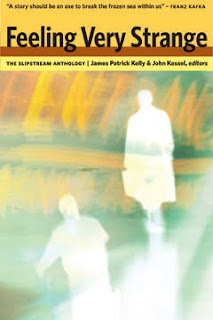 One of my favorite books in the Tachyon arsenal is Feeling Very Strange: The Slipstream Anthology. I like to recommend it when people ask me for book suggestions, but this always leads to the question "But what is Slipstream?" and apparently I'm not the only one getting asked this question. Long Answer: ...well, for that I will now hand you over to the Science Fiction Research Association. Ready to get schooled in Slipstream? This is the class for you: Slipstream 101. I do like what Kessel and Kelly had to say about it: that it is more a technique of cognitive dissonance. Though I have to confess to using it in the "in between speculative and literary" meaning. To get a picture of how I use the word, I might refer to the novel The Wind-Up Bird Chronicle.